Women in motorsport from 1897 to the present day. Baronessa Maria Antonietta d’Avanzo was a pioneering driver of the 1920s. She was born in 1889, and learned to drive very young, encouraged by her father. When she married, later, her husband, Eustacio d’Avanzo, also encouraged her driving talents, and bought her a 35hp Spa sportscar to race. Her first big race was the 1919 Giro del Lazio, and she won her class, despite having to replace an errant wheel during the event. She arrived fully on the scene in 1920, entering the Targa Florio in a Buick. Like many other entrants that year, she did not make the finish, retiring during her third lap. In 1921, she drove an Ansaldo 4CS in Italy. This was as a reserve driver, as another team member had dropped out. She was team-mate to Tazio Nuvolari. At the Circuito del Gardo she was seventh, third in class, while another lost wheel put her out of the Circuito di Mugello. She also drove an Alfa Romeo ES to a third place finish in a "Gentlemans'" Race in Brescia, during Speed Week. Paradoxically, she finished Speed Week with the Coupe des Dames. In another American car, an enormous twelve-cylinder aero-engined Packard, she entered the speed trials at Fano beach in Denmark. Here, she was notable for surviving a fire to her car, partly due to her quick thinking in driving the burning Packard off the dunes and into the sea. The car, and by token, its driver, caught the attention of a young Enzo Ferrari. Her second Targa attempt came in 1922, in the Alfa this time. Again, she did not finish. It is here that the Baronessa disappears from the scene for a few years. In 1925, she is said to have raced in Australia, but few actual results have ever surfaced. Contemporary newspaper articles state that she definitely stayed there for some time in 1924. There is one report of her driving an Essex in a “match race” at Penrith Speedway, although this may have been an exhibition. During this time, she took part in some of her other adventurous activities, such as flying, and wrote articles about sport for various publications. She returned to Europe. and motorsport, in 1926. According to some sources, she raced a Mercedes in that year’s Coppa della Perugina. Later, in 1928, she entered her first Mille Miglia, driving a Chrysler Tipo 72 with Manuel de Teffé. They did not finish, after a mechanical failure. The following year, she and Carlo Bruno retired early on, driving an Alfa Romeo 6C 1750 SS. 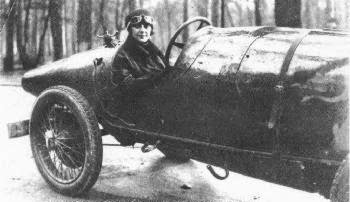 After a break in 1930, she made another attempt at the Mille Miglia, in a Bugatti T43, driving with Carlo Castelbarco. Once again, the treacherous Italian roads denied them. Back in the Alfa, she scored a third in the Coppa Pierazzi, and another third in the Grosseto-Scansano hillclimb. 1932 saw her final try at the Mille Miglia. This time, she was part of the official Scuderia Ferrari entry, driving an Alfa Romeo 6C 1750 GS Spider Touring with Francesco Severi. Sadly, they did not finish. There was disappointment later in the year, also. She was invited over to the USA by Ralph de Palma, to test his Miller Special at Indianapolis. Regulations forbade women from racing, but she would be allowed to do some demonstration laps. Unfortunately, she struggled with the car, having not handled a huge American racer for years, and did not post good times. She returned to Italy before she was due to make her appearance. After that, she began to wind down her motorsport career, and made only a few starts. Some sources have her as a driver in the 1933 Targa Abruzzi, but her choice of car is unclear. She definitely entered the 1938 Targa in a Stanguellini Fiat 1500, but probably did not finish. Her last recorded race was the 1939 Tobruk-Tripoli race, driving a Fiat. She was sixth in the 1100cc class, ahead of the other Italian female competitor, Lia Comirato Dumas. In 1940, she is listed as an entrant for the Mille Miglia, driving a Fiat 1100 with Angelo Della Cella. They did not make the start. Throughout her life, as a social personality, journalist and writer, Maria Antonietta was a vocal supporter of female drivers, on the track and on the public roads. She was adopted as a heroine by early Italian feminists. As well as this, she had many friends and allies in the male-dominated motorsport world, such as De Palma and Enzo Ferrari.